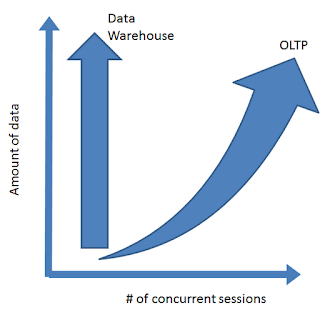 In my previous post,http://database-scalability.blogspot.com/2012/05/oltp-vs-analytics.html, I reviewed the differences between OLTP and Analytics databases. Scale challenges are different between those 2 worlds of databases. Scale challenges in the Analytics world are with the growing amounts of data. Most solutions have been leveraging those 3 main aspects: Columnar storage, RAM and parallelism. Columnar storage makes scans and data filtering more precise and focused. After that – it all goes down to the I/O - the faster the I/O is, the faster the query will finish and bring results. Faster disks and also SSD can play good role, but above all: RAM! Specialized Analytics databases (such as Oracle Exadata and Netezza) have TBs of RAM. Then, in order to bring results for queries, data needs to be scanned and filtered, a great fit for parallelism. A big data range is divided into many smaller ranges given to parallel worker threads that each performs his task in parallel, the entire scan will finish in a fraction of the time. What can be done to solve OLTP scale challenges? In my next post let's start answering this question with understanding why solutions proposed for the Analytics are limited in the OLTP, and start reviewing relevant approaches. Stay tuned, subscribe, get involved!